Cozy, chic and the perfect sentiment to your fall and winter needs. This top makes it easy to keep warm thanks to its construction out of a beautiful French terry. Top it over your leggings, your denim and all your trousers and skirts. I live in these asymmetrical tops from Rhonda. Have a bunch of them in slightly different material. Love this one best because of the soft fleece on the inside. This one seems to stay better on the shoulders. Looks awesome with leggings. Casual wear at its best. Rhonda, please bring back this particular top in a bunch of different bright colors. Very slimming. I love this shirt you can dress up or dress down. I love the shade of blue. I could have down sized but still happy with the larger size. I would purchase again. This is a good staple to have. 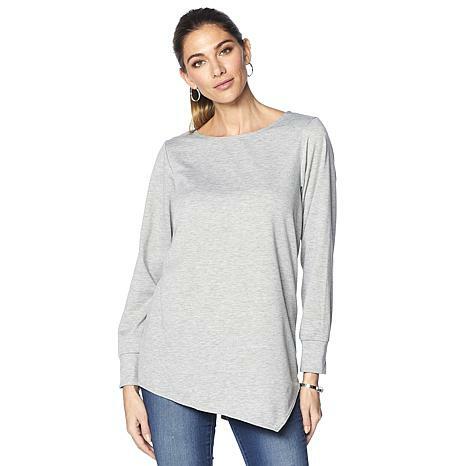 This top is very soft and the length is just as shown which is great for me. The issue I'm struggling with is it seems tight across the shoulders area. Very tight when you raise your arms. I'm afraid if I went up a size it would be to big around the breast and stomach area. Probably going to have to send it back.